probably the last update for this year... so may i wish you all a merry christmas, happy holidays and hopefully we see each other on-line next year!! Thank you all for having a "little" faith in the archives!!! "in the john..." fanclub magazine, December 1991 on-line now!. Surf to "collectors > in the john" or click here. 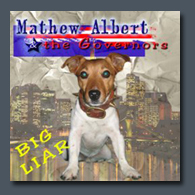 Out now, a great new album "Big Liar". Please take time and visit there website www.thegovernors.de to listen, buy or download this album. Q: This album sounds great!! How do you feel about it? A: I think the sound will be better from time to time! The first 4 songs we recorded only on a Saturday and the voices half a day on Sunday... I like it, also! it's every time different for me to say: "yes, I like it!!!" I think the most musicians are having this sickness... ;-) But a lot of people are going to like that cd!!!! Q: What happend to "the fuzzy peaches". A new name?? A: Yes, we got a new name... thegovernors. 'cause in germany all the people said "futzi" instead of "fuzzy" !!! Out now "live at the hiatt". Limited edtion, 5000 copies..... so better hurry and go buy it right here. More information about the release of this 13 year old recording can be found here. some beautiful photo's made by Patrick Breen. downloads > pictures > fans. And another issue on-line from the "in the john..." fanclub magazine. october 1991. "collectors > in the john" or click here. few months later then normal (because of vacation) we take you back 15 years ago to july 1991. 15 years ago you could read all about john's vacation in the fanclub magazine "in the john...". issue 4 is on-line now! surf to "collectors > in the john" or simply click here. a few new tourdates added on our tourshedule. out now on BGO records: digitally remastered 2 on 1 cd "hangin around the observatory / overcoats". listen to this album and buy it on www.bgo-records.com. more information right here. some nice live shots made by a fan can be found under downloads > pictures > fans. shawn mullins "9the ward pickin' parlor"
linda rondstadt & ann savoy "adieu false heart"
edwin mcCain "lost in america"
garrison starr "the sound of you and me"
carbon leaf "love loss hope repeat"
CD release "heartworn highways" : A companion album to the 1976 film documentary Heartworn Highwaysreleased on March 14 featuring previously unreleased recordings from Steve Earle, Townes Van Zandt, Rodney Crowell, John Hiatt, Guy Clark and David Allan Coe, among others. Filmed in Nashville and Austin, Texas, the documentary focuses on these singer-songwriters in the earliest days of their careers........ Read more here. Uploaded assorted photo's from all over the internet. Click "downloads > pictures > assorted". Check out on the same directory for some older "fans" photo's. it's time for another issue of the retired "in the john... fanclub". 15 years ago volume 3 came out. check it out now here. Check out www.vanguardrecords.com to find out more about 2 forthcoming albums from Shawn Mullins "9th Ward Pickin' Parlor" and A Tribute to John Fahey - Various Artists "I am The Resurrection". Believe me, it's worth listen to these! 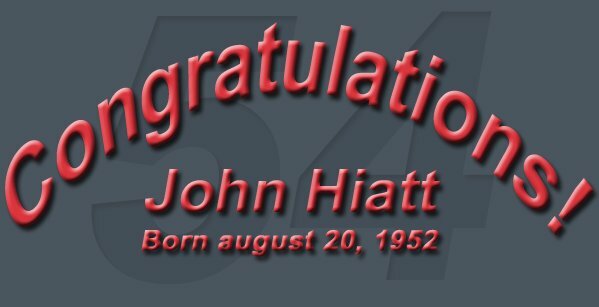 If we look back to 2005 we can say (in my opinion) it was a successful year for john hiatt. a brand new album "master of disaster" peaked at number 10 on the Top Independent Albums chart and on the album top 25 of American connection he peaked on number 6. release of the Austin Texas concert from 1993 on CD and DVD and another great DVD full house. then also the A&M label did a re-release from 3 albums named "chronicles". we were treated on some great concerts, solo or with the north Mississippi allstrars in the USA and in Europe as well. On the archives it was a successful year too! we made a new design on our website, had a lot of new members on our forum, a lot of positive comments from record labels like new west records, vanguard records and other official authority's. We also had a lot of support from klanderman promotion, WXRT Radio, danima, pinkpop, hostingswijzer and many others. I wanne thank all of them for there great support. also a big "thank you" to Nineyear w, Bernie c, George f, Mary j, bob b, Morgana k, Emily d for all your help, and ofcourse john hiatt for the great music you made. But most of all i wanne thank all the people on the john Hiatt archives forum, you made me "going on" with the archives in good and in bad times! thanks to all my friends and family (jo, Pierre) for your time, support and interest. thank you Astrid for believing in me! !